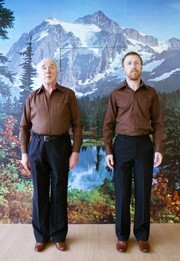 Performers Michael Pinchbeck and Simon Bowes each bring their parents to work for this double-bill of distinctly personal performance, reflecting on family histories and the passing of time. Award-winning writer and performance maker Michael Pinchbeck takes his parents, Tony and Vivienne, on tour to recreate the post-show party where they met in 1970 after an amateur dramatic production of The Sound of Music. In 2001, the father of artist Simon Bowes fell from a bicycle and forgot his name, where he was and where he lived. Performed by Simon alongside his 74-year-old father, Where we live and what we live for attempts to explore the passing of time and a world of forgotten people and things. This carefully crafted assembly of personal history and stories meditates on love, loss, happiness and how to get better with age. Co-commissioned by Nuffield Theatre Lancaster and BAC. *A Night Less Ordinary - There are a limited number of free tickets available for this double-bill to those aged 16-25. Please contact the box office for further details.